The Shoreline Model Yacht Club website was created to keep members informed, and attract a broader audience by introducing ourselves to the community. We'll use this site to inform people about our club, share ideas, and organize events and activities. The Shoreline Model Yacht Club was recognized by the American Model Yacht Association in December 2003. With 3 founding members, we formed to promote model yacht building and sailing. We meet at Shoreline Lake in Mountain View, CA. on Saturdays, year around for informal sailing and racing. The our group sails on the third Saturday of each month, weather permitting. Follow the signs into the park directing you to the Lakeside Cafe/Sailing Center. We sail at the south end of the lake, near the golf course, on the lawn next to the Lakeside Cafe. Check the schedule on the Race Standings page for start times. We welcome visitors and enthusiasts of all ages. Visitors are welcome to sail our boats and we are pleased to offer information and help for anyone interested in getting into model yachting. 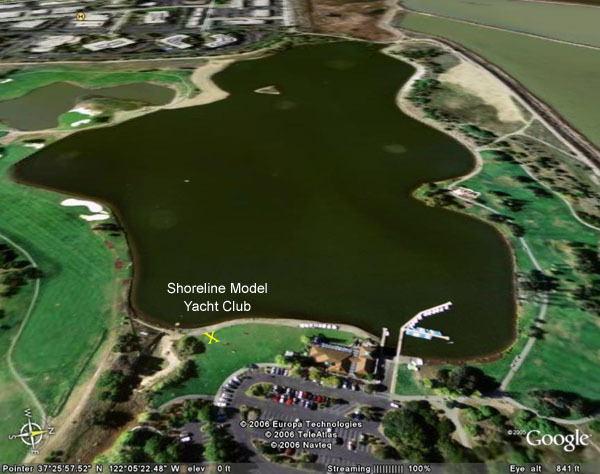 The links provided below are for more information on the American Model Yacht Association and Shoreline Park, our sailing venue. Shoreline Park, Mountain View, CA. Waiting for The Starting Bell. Displacement: 6 lbs. 4 oz. Hull and Deck molded one-piece ABS plastic, Aluminum spars. Sails are single panel Dacron. Keel and Rudder are removable. Rigging is 80 # test spectra string. Kit comes with everything, including a 2 channel radio, servos for steering and sail control. Approx. 40 hours to build the boat, or boats can be purchased "Ready to race" and are available from Chesapeake Performance Models.Very strict one-design racing rule ensures all boats are equal. For more information on the CR 914, go to the official CR914 Website. 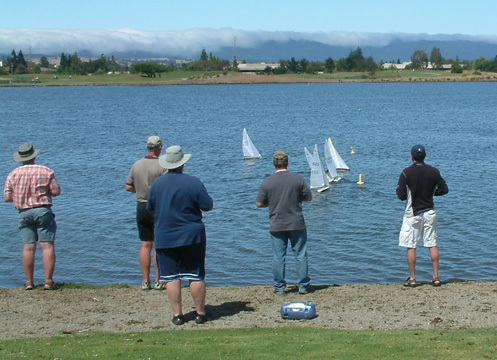 When down in the San Luis Obisbo area, visit our friends at the Laguna Lake Model Yacht Club. Just for fun , here is a link to a sailing simulator.